This wide mouth food jar features vacuum insulated technology that keeps foods cold up to 12 hrs and hot up to 8 hrs. It also features 18/8 food grade stainless steel, and a 100% leak-proof lid that eliminates spillage in lunch bags, briefcases or backpacks. The exterior is cool to the touch, even when containing piping hot soups or stews. It's also great to keep salads and fruits cool and fresh, enhancing any lunch. 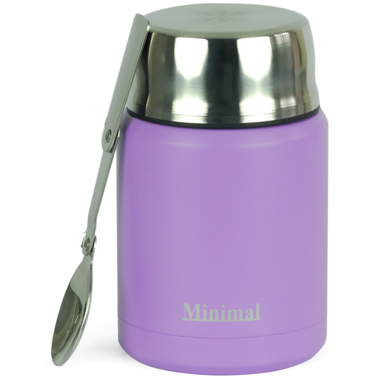 It Includes a folding stainless steel spoon to allow easy eating. Help maintain a health lifestyle by bringing fresh healthy foods from home and create a litterless lunch.